Congress has just about two weeks to produce some kind of legislative response to the influx of unaccompanied minors at the U.S.-Mexico border. Lawmakers are mulling over President Obama's $3.7 billion plan to address the humanitarian crisis, but a handful of Republicans this week upped the ante with different pieces of legislation they want to prioritize. Chances that Democrats will sign onto the Republican bills seem low. The partisan divide over the border crisis is not that unexpected, given the failed efforts at passing comprehensive immigration reform. Still, immigration advocates say this situation is different and deserves quick action. "I think doing nothing before August is not an option," Kevin Appleby, director of migration policy for the U.S. Conference of Catholic Bishops, told CBS News. "Both sides cannot afford to play politics with this issue, as Americans expect Congress to work together to address it. In the end, I think the side which blocks the funding bill for changes to the law will be viewed as obstructionist." Republicans have offered up various conditions for passing Mr. Obama's spending bill following months of attacks against the president's immigration and border policies, suggesting he can't be trusted on the issue. Those arguments were tinged with election-year motivations, and the current debate may be stalled by midterm concerns as well. "The administration's in a tough spot -- they have a crisis on their hands that's getting a lot of publicity, and they need money to deal with that crisis," Kamal Essaheb, an attorney for the National Immigration Law Center, told CBS News. However, "Congress controls the purse, and we're seeing Congress basically using that power right now to try to put the administration in as bad as a position as possible." Essaheb and Appleby both said Congress needs to put politics aside and think of the children at the center of the crisis. "Here we have a humanitarian situation -- children fleeing violence from a couple countries," Essaheb said. Salmon's short piece of legislation would amend the William Wilberforce Trafficking Victims Protection Reauthorization Act of 2008 -- a law that's been at the center of the current crisis. That law, which passed with strong bipartisan support, makes it easier to deport children from Mexico or Canada than from non-contiguous countries. Salmon's legislation would change the law so that all unaccompanied children, from any country, could be returned to their home country in an expedited manner, without immigration court proceedings. The congressman said in a statement that he wants to ensure the U.S. can "quickly reunite these children with their families." Democrats in the Congressional Hispanic Caucus are adamantly opposed to changing the 2008 law, arguing that the children arriving from Central America deserve their day in court. "Republicans will have the Hispanic Congressional Caucus to contend with" should they try to reverse the law, Rep. Luis Gutierrez, D-Ill., said last week. He added that the CHC would not sit silently by while "children are being demonized... when their legal rights are being questioned." The bipartisan duo from Texas -- both critical of Mr. Obama's response to the border crisis -- teamed up to produce their own bill to amend the Wilberforce law. Like Salmon's bill, the legislation would treat all unaccompanied migrant children crossing the border equally. If a child intends to stay in the U.S., he or she would get an initial court hearing within a week of their arrival. Then, a judge would have 72 hours to determine whether or not the child has a legal claim to stay in the U.S. If not, the minor would be sent to his or her home country immediately. The bill would also send about 40 immigration judges to the border to speed up immigration court proceedings for the youngsters. On Tuesday, Senate Majority Leader Harry Reid, D-Nev., dismissed the Cornyn-Cuellar bill as "too broad." Once again, this bill would amend the 2008 law to allow for any unaccompanied minors -- regardless of their country of origin -- the chance for an expedited return home. The legislation would also require unaccompanied minors to stay in the custody of Health and Human Services or Customs and Border Protection until they are sent home or their immigration cases have arrived at an outcome. Additionally, the bill would increase the number of refugee applications by up to 5,000 each for the countries of El Salvador, Honduras, and Guatemala. It also funds more resources for processing immigration cases, including 100 temporary immigration judges and 150 new immigration litigation attorneys. Carter's bill, like the others, amends the 2008 law to treat all unaccompanied minors equally. It would also require the children to stay in the custody of Immigration and Customs Enforcement longer. Once the government finds family sponsors to take care of the children while their immigration court cases are pending, Carter's bill would require the government to investigate the immigration status of those sponsors. The bill is co-sponsored by Rep. Robert Aderholt, R-Ala., and Rep. Jack Kingston, R-Ga. This legislation would put all unaccompanied minors in "expedited removal proceedings," according to a release from the lawmakers, unless the children have a "legitimate credible fear of persecution in their home country." The bill also tightens the standards for asylum seekers, in party by denying the unaccompanied minors the border preferred access to asylum. Additionally, Chaffetz and Goodlatte want to give Border Patrol access to federal lands and explicitly prohibit the use of taxpayer dollars to pay for lawyers for unlawful immigrants. 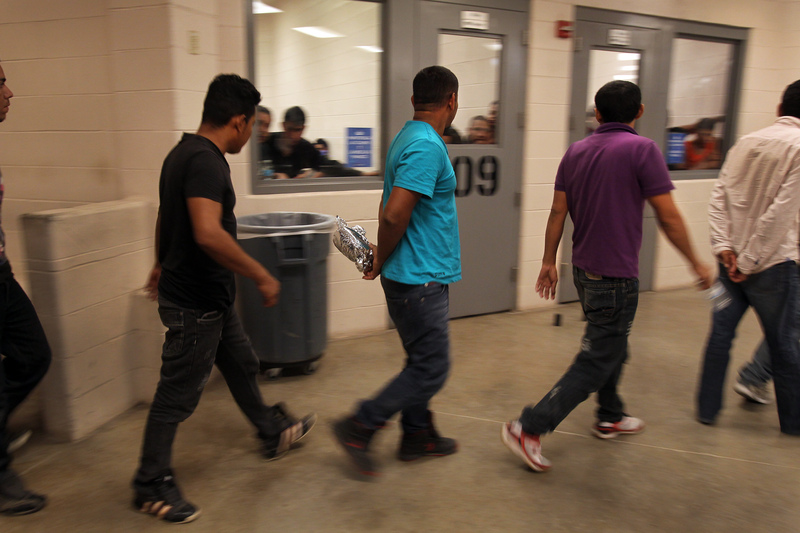 The bill also provides a temporary allotment of immigration judges and ICE prosecutors. Cruz is taking the most aggressive attack against Mr. Obama's policies, filing legislation to prevent the expansion of the DACA (Deferred Action for Childhood Arrivals) program. The program, which Mr. Obama enacted in 2012, allows certain undocumented youths to stay in the country legally (temporarily) if they meet certain requirements. Reid on Thursday railed against Cruz's idea. "The deferred action plan is a positive step forward and we should not go back, especially not as a ransom for helping our border personnel care for desperate children," the majority leader said.